September is a month for dynamic change—the kids are back in school, the leaves trade their green for gold, and your team starts its march to the Big Game in February (hey, this has to be the year). In the spirit of the season, we’re rolling out an assortment of new product updates to bring welcome changes and dynamic improvements to your work. 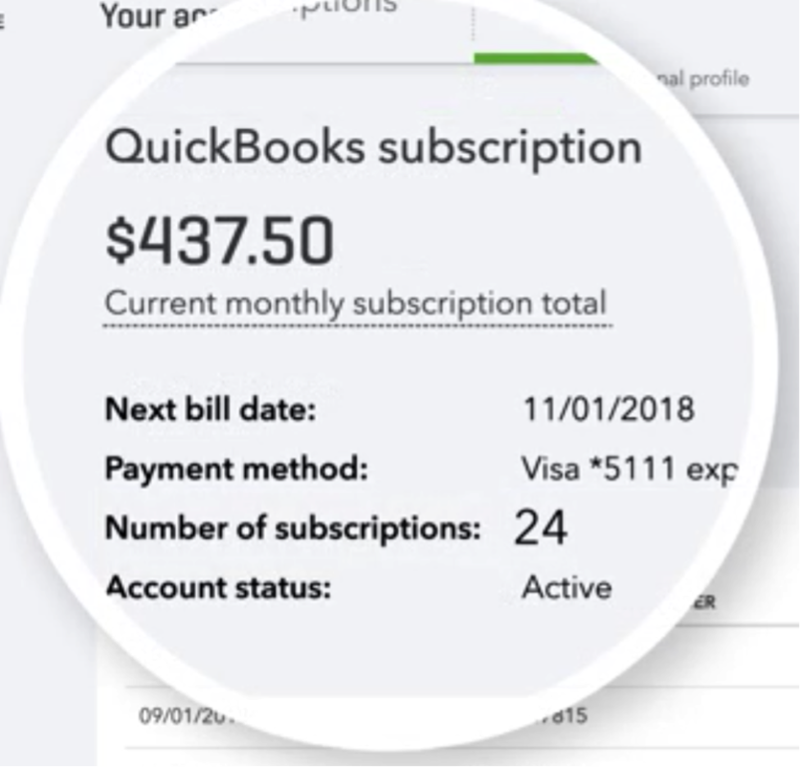 In a nutshell: Managing your clients’ QuickBooks® Online and Payroll subscriptions is an integral part of your job—but it shouldn’t be a time-consuming one. We’ve made some key changes to ensure you can view your clients’ subscription fees and your billing history at a glance, and make quick changes to their subscriptions from a central dashboard. Redesigned “Your account” page: A new layout lets you quickly toggle between a list of your client subscriptions, billing details, and your personal profile. When you add a new client subscription, you’ll see their status change to Active immediately. You can also now subtract multiple clients from Your subscriptions in bulk, instead of one by one. Updated “Billing details” page: We’ve made it easy to get a clear picture of where you stand by providing key details at a glance—such as total number of subscriptions, amount you currently owe, and past monthly charges. 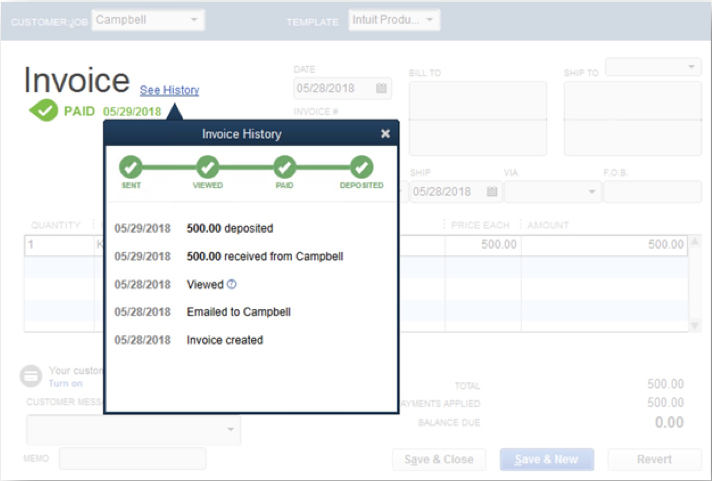 New QuickBooks Online invoices: From the “Billing details” page, you can download our newly designed monthly invoices. We’ve itemized them by easy-to-scan categories (such as by product or by client), and reduced manual busy work by automatically calculating each client’s bill as well as your sales tax. You’ll receive an email from us the month before you’re scheduled to move to the new billing platform. Your account will update automatically on your specific billing day for that month. In a nutshell: Being in the dark is fine for stargazers, but it’s terrible for your team. 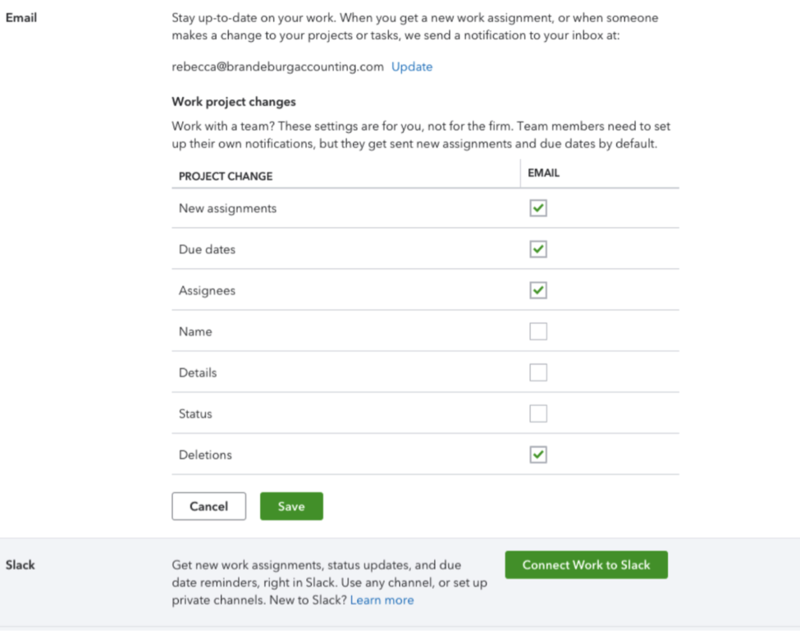 With new email and Slack work notifications, you can add much-needed clarity across your whole practice and ensure new assignments, updates, and due dates show up right where your team members will find them. How it works: In the Work tab of QuickBooks Online Accountant, select the Notifications link along the top of the page. Select the email notifications you want your team to receive, such as new assignments, due dates, and status updates. For even greater visibility, connect notifications to your team’s Slack. Hit Save once you’ve made your selections. That’s it! Continue assigning projects or making updates in QuickBooks Online Accountant as usual. Your team will get a message in their inbox like the one below, and you can rest easy knowing everyone is on the same page and hitting their deadlines. Start setting up your Work Notifications. In a nutshell: Nothing slows your productivity like wasting time on prep. 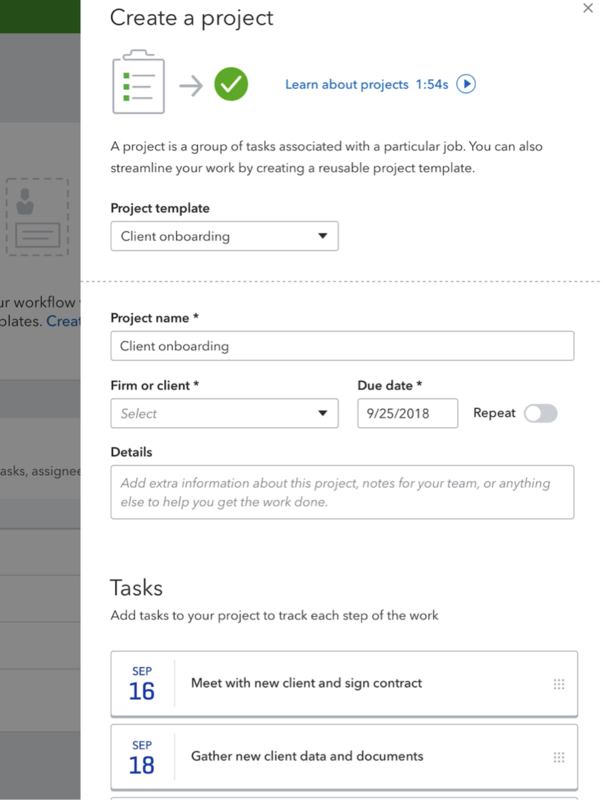 Our new pre-filled Quickstart templates take the guesswork out of setting up projects and tasks so you can save time and ensure consistency no matter the job, from payroll to taxes to bookkeeping. You can even create custom templates tailored to your clients’ needs. 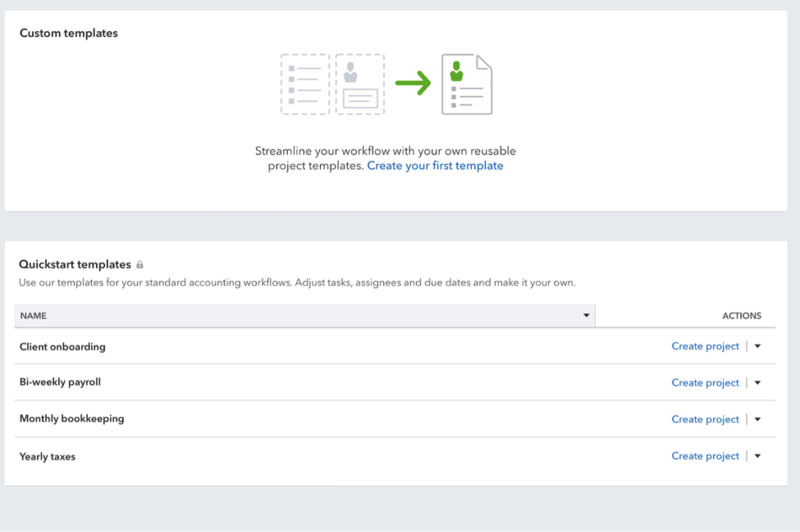 How it works: In the Work tab of QuickBooks Online Accountant, select Manage templates. Choose from our existing Quickstart templates, or create a custom one to add to the list. When you select the template you want, a drawer will open where you’ll enter a few key details about your project—such as due dates, tasks, and whether you want it to repeat. If you’re going the custom route, you’ll also need to name the template. Select Save once you’re ready, and voila. Reference your template list for fast, easy, and consistent project setup across all your work and clients. Get started here. Status update: Our direct bank feed update (originally released in June) is now available to Capital One users. In the meantime, reference our FAQ on direct bank feeds to help troubleshoot issues and find answers. Get a refresher on the details of direct bank feeds here. In a nutshell: This is has been one of our top requests from small business owners, and we’re thrilled to announce it’s here. 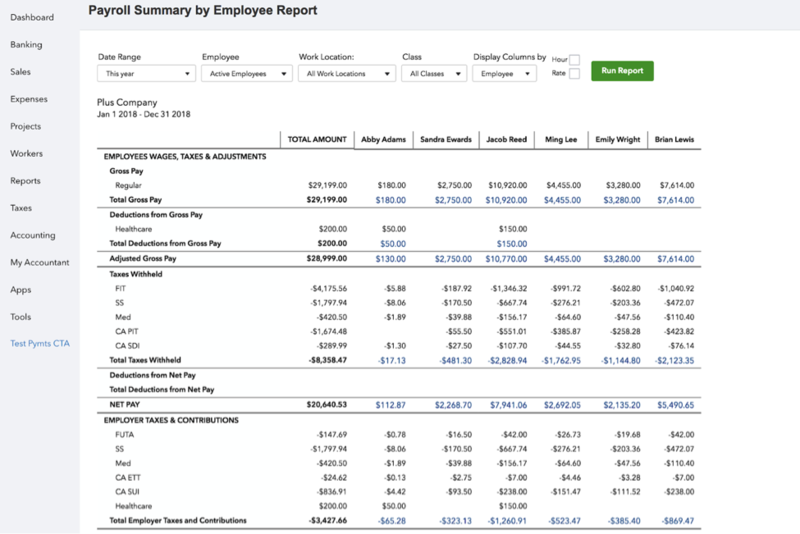 Your clients can now get a bird’s-eye view of all their employees’ payroll information on one page—including wages, deductions, and tax data—so they can learn more in less time. 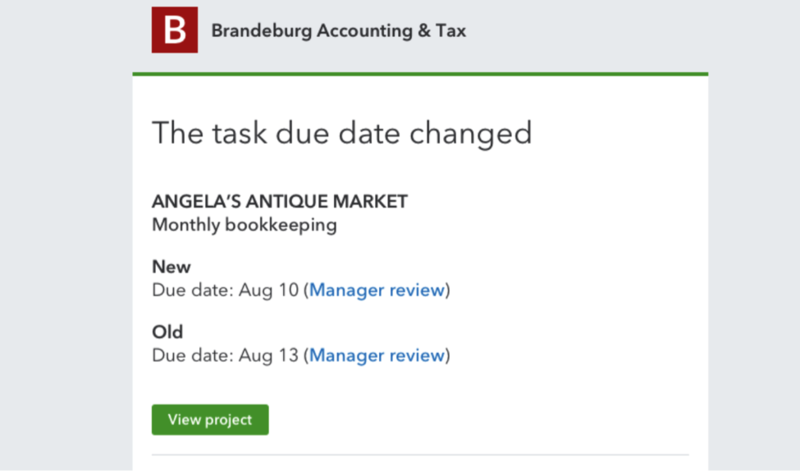 How it works: Your clients can access their payroll summary in the Reports tab of QuickBooks Online. They can sort the report by time period, employee type, work location, and other variables. Once they’ve chosen their filters, they simply need to select Run Report to get a fast, clear understanding of each and every employee’s financial impact. Clients can select a specific line item to see a detailed report for a given employee, including individual paycheck details for the period. New! 2019 QuickBooks Desktop Pro, Premier, and Enterprise Solutions. Mac is back, too! In a nutshell: We have a flurry of new and improved features across our family of desktop products—including QuickBooks Desktop Pro/Premier, QuickBooks Desktop Enterprise Solutions, and QuickBooks Desktop for Mac (that’s right, after a three-year hiatus, Mac is back!). Transfer customer credits across jobs. Link checks you’ve written to open bills so your books stay accurate. Easily identify and reconcile discrepancies between bank statements and QuickBooks records. And that’s just the tip of the iceberg. Read a full breakdown of our 2019 desktop improvements here. 1 File size reduced by Data File Optimization feature reduces file size by removing audit trail of historic transactions and a few tables from the database that are not used or needed by the company file. 2 iCloud is a registered trademark of Apple Inc. Apple ID required. QuickBooks Desktop for Mac for use with iCloud requires macOS Sierra, High Sierra, or (when released) Mojave. 5 GB of storage is included at no charge. Users can pay Apple for additional storage by visiting the following URL: https://support.apple.com/en-us/ht201238.